The Chargers picked Merriman in the first round of the 2005 NFL draft (12th overall), who had received All-ACC recognition in college. While it was speculated that he might play at defensive end, he was utilized as an outside linebacker for San Diego. A holdout initially slowed his progress and he didn’t move into the starting lineup until seven games into the season, but his presence had a major impact on the defense. Chargers went 9-7 to finish third in the AFC West while leading the NFL in fewest rushing yards allowed (1349). 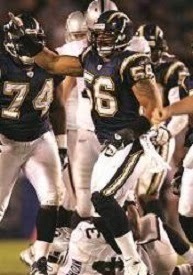 Merriman followed up in 2006 by leading the NFL in sacks with 17. He received consensus first-team All-NFL honors as well as another Pro Bowl selection. Tenacious, aggressive, and fast, he quickly established himself as a premier pass-rushing linebacker who could also play well when dropping back into coverage. He had another 12.5 sacks and was selected to a third Pro Bowl in 2007, but a major knee injury that required surgery cost him virtually all of the ’08 season and marked the beginning of the end of his career. While he came back in 2009, nagging injuries hindered Merriman’s play and he was released while on injured reserve during the 2010 season and signed by Buffalo. He saw little action with the Bills due to injuries and, after playing at defensive end in 2012, retired. Overall, he accumulated 45.5 sacks, with all but six of them coming during the first three outstanding years of his injury-derailed career.